Online hotel booking engine serving over a million unique visitors a day. Room Key is a lean start-up in the most competitive online marketplace. Six of the world’s largest hotel chains use the online booking engine to offer guests a personal travel planning experience and direct booking at guaranteed lowest rates. 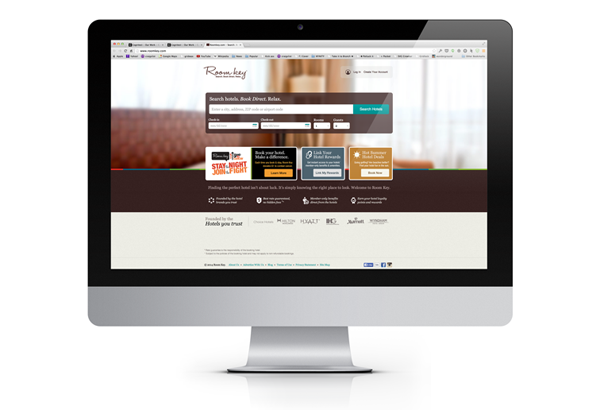 With more than one million unique visitors to its site every day, Room Key is a powerhouse that increases conversion rates for its hotels and ensures travelers experience each hotel’s personal touch. Room Key partnered with Cognitect consulting to help them realize their vision of a scalable system built for the cloud from day one. "Most venture-backed start-ups fail. We wanted to beat the average, so we had to choose above-average partners." Room Key engaged Cognitect's expert consultants, project managers and designers to join their internal team and accelerate development while simultaneously providing support for Room Key's adoption of Clojure and Datomic. "Clojure is a secret weapon. It self-selects for smart developers." Cognitect consultants, working closely with the Room Key team, used Datomic to expand query flexibility, track user search behavior and account data all while dealing with a huge number of transactions. "We saw this as an opportunity to check out a newer technology that would give us a competitive edge." Using the custom software built by the combined Room Key/Cognitect team along with Clojure and Datomic, Room Key can offer travelers another direct-booking option that compares rates across member hotels. As a result, conversions have increased, and Room Key’s member hotels can avoid fees charged by third-party websites that offer cut-rate booking services. "Datomic is not your average database technology. It allowed us to deliver high-quality software on time and on budget. It’s a great tool to have in your toolbox." "[W]e knew Cognitect would provide the kind of support we needed. They have been our partner in every sense of the word. They resolved most of the few problems we encountered before I got to them." Room Key expanded its use of Datomic from primarily a user-data repository to include user account data, enabling the site to attract and build a loyal customer base. The Cognitect team worked with Room Key to scale its read rate and encrypt the database.